A yearling and mature doe in Stage 1 Alarm. 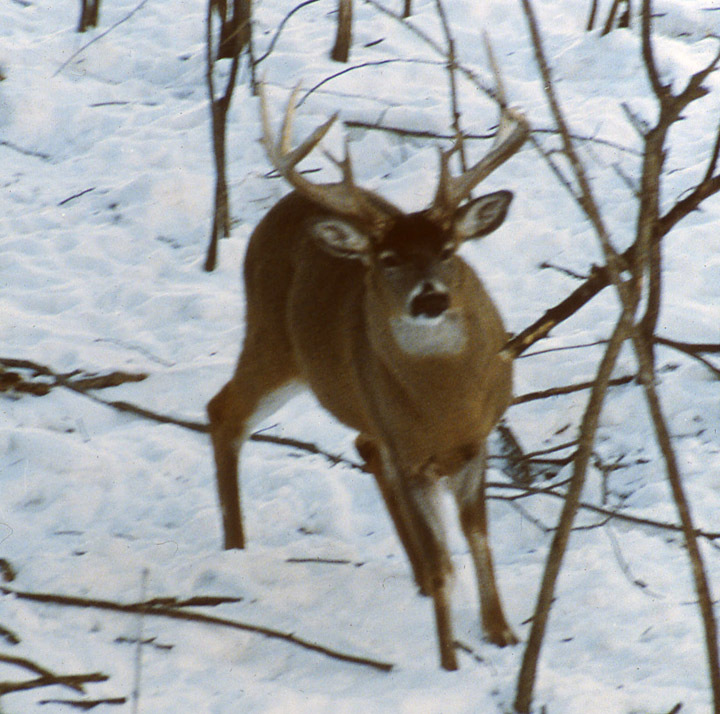 A whitetail suddenly raises it's head, ears cocked forward, tail down and relaxed (not fanned) and the deer stands frozen, starring in your general direction (or some other direction) without regard for cover.. What should you do? Three unsure whitetail does — tails down — in Stage 1 alarm. What you are seeing is stage-one alarm in a whitetail. Because its tail is down and relaxed, the deer is not greatly alarmed. It heard something (a soft twig snap, for example), spotted a movement made by something yet unidentified or caught a barely discernible whiff of something that suggests a so-far-unidentified creature is near. If the deer then turns it head in more than one direction and/or if its ears turn in various directions, it doesn't know where that creature is located. At this point the deer is attempting to positively identify that creature, whether or not it is potentially dangerous and exactly where it is located. If the deer now detects an identifiable airborne odor drifting toward it from the hunter, it will then know exactly what the hunter is, and where it is, after which the deer will depart with caution or all possible speed. lf it cannot smell the hunter, being upwind or crosswind, it will spend the next few minutes attempting to determine what made the suggestive sound or movement. If the hunter remains frozen, making no sounds or motions, the deer will not succeed. If the deer is within 30 yards, the hunter should not stare directly at the deer. Within that distance whitetails readily sense when something to be concerned about is staring at them, thus drawing their attention. 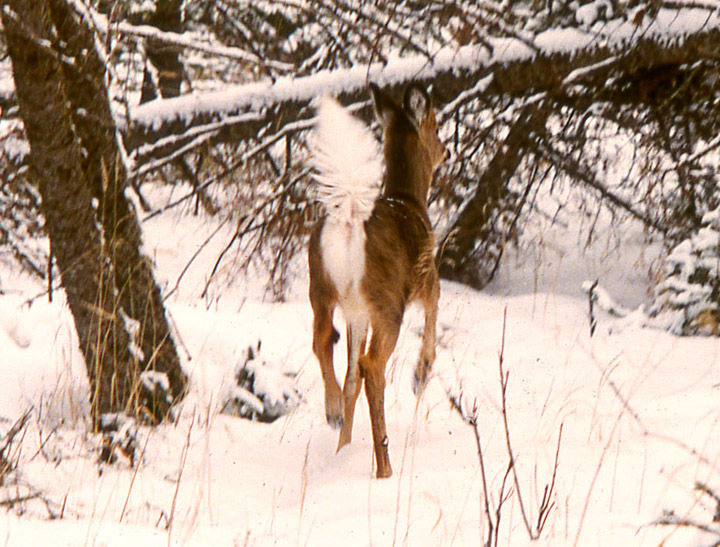 Upon failing to detect anything further that suggests a potentially dangerous creature is near, the whitetail will flick its tail from side to side, indicating it is now convinced it is safe, and resume whatever ir was doing (feeding, for example) without haste. Though the deer may now act as if completely unaware of the nearby hunter, it will remain extra alert for awhile, making it especially difficult to approach via even the most skilled stalking. 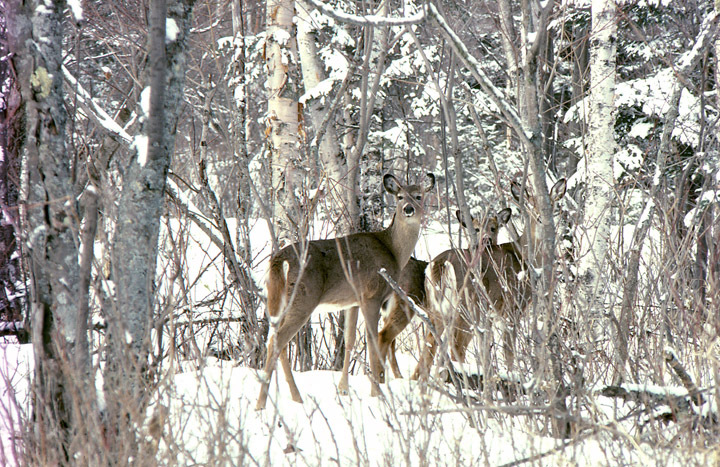 Odds for hunting success be much improved if the hunter remains frozen until the deer is at least temporarily hidden by intervening cover, at which time the hunter can prepare to fire at the deer as soon as it becomes visible again without being spotted by the deer. 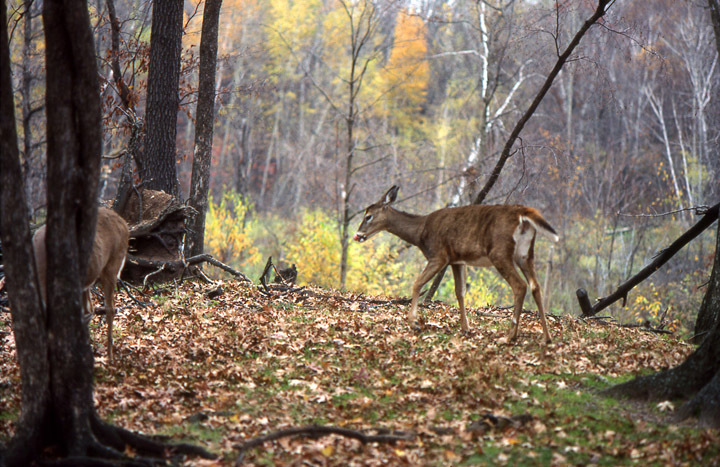 If stand hunting, avoid making sounds and do not prepare to fire your gun or bow while one or both of the deer's eyes are visible. A deer ahead spots a hunter a safe distance away (100 yards or more) and initially reacts with stage-one alarm. It then notes though it is obvious the hunter has not yet spotted it, the hunter not suddenly halting or sneaking in its direction, the hunter is traveling in a direction likely to lead to a short range confrontation. The deer's ears then turn back (tips pointed back toward its rear) as if annoyed at the thought of having to do something to avoid to avoid danger. The deer then moves without haste to cover away from the hunter's path and freezes, awaiting developments. Throughout all this its tail remains down and relaxed, white hairs not distended. This is stage-two alarm. 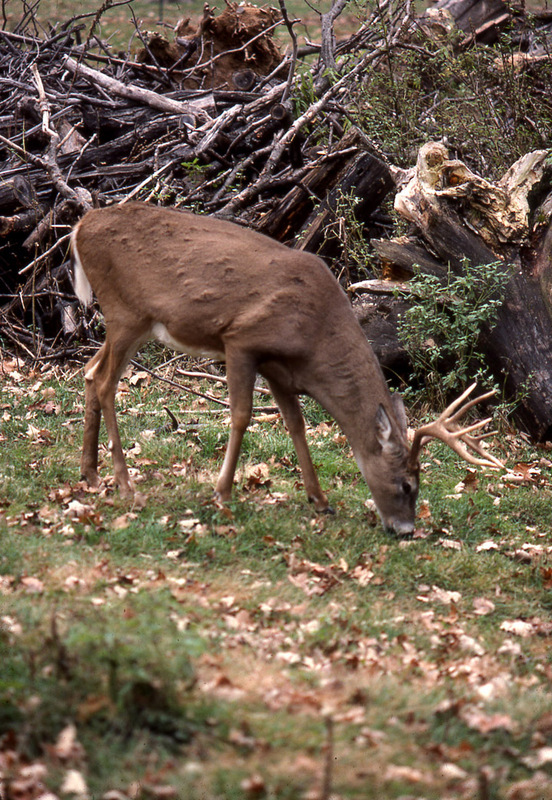 Stage-two is a very common form of whitetail alarm during hunting seasons. Especially during opening weekend, hunters (including those making drives) unwittingly pass within easy shooting range of eight or more whitetails frozen in cover per mile traveled on foot. This whitetail is in Stage 3 Alarm. Her tail is up — but not fully fanned. She is not bounding. Instead, she just quickly moving away. In Stage 3 alarm, some deer will trot away. Stage-three alarm is like stage-two alarm but in this case the deer moves rapidly to cover (not bounding), the reason being, an unaware hunter (hiking steadily at a moderate pace) is suddenly detected moving toward the deer less than 100 yards away. 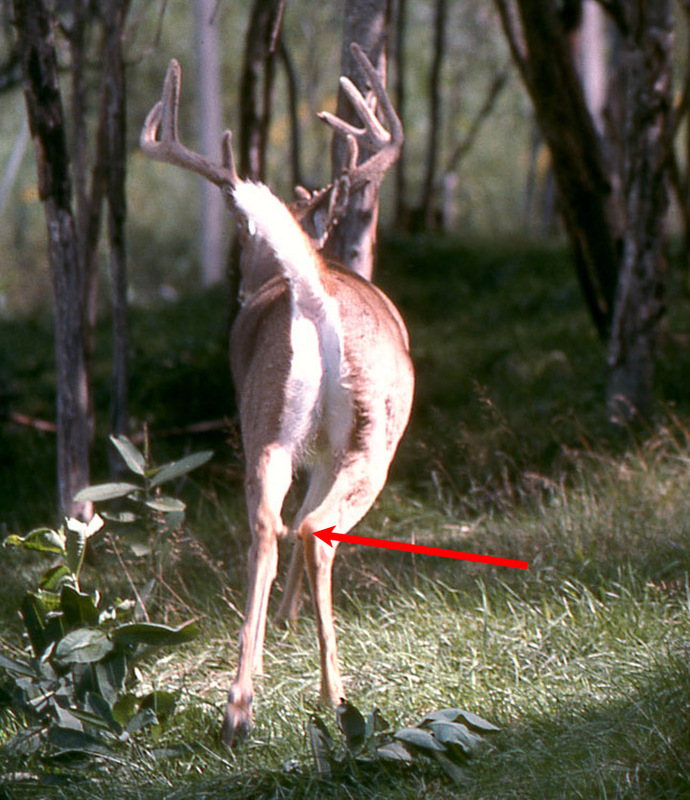 Ordinarily, the deer will move from the hunter's path with its tail down but a tail up response is not uncommon. In this case, however, the white hairs of the trail and rump will not be erect (fanned) and as it moves away, its upright, narrow-appearing tail will wag loosely from side to side. Though not greatly alarmed (the deer likely being a well experienced whitetail), it might soon decide to reestablish a safe distance by moving stealthily away well before the hunter appears in the area, tail down — a response characteristic of older bucks. Though moving hunters rarely realize when whitetails ahead have responded with tail-down stages of alarm, it's not a bad thing. Whitetails doing this have concluded the approaching hunter is not particularly dangerous and for this reason, deer that merely walk away from the hunter's path are unlikely to abandon the area, greatly improving the likelihood of seeing them later. The hunter who walks non-stop at a moderate pace while traveling to or from a stand site will see many more unsuspecting deer (easy targets) than the hunter who halts often to listen and peer about or sneak from site to site while hunting. Most deer spotted by the latter hunter will be responding with stage-four or five alarm. 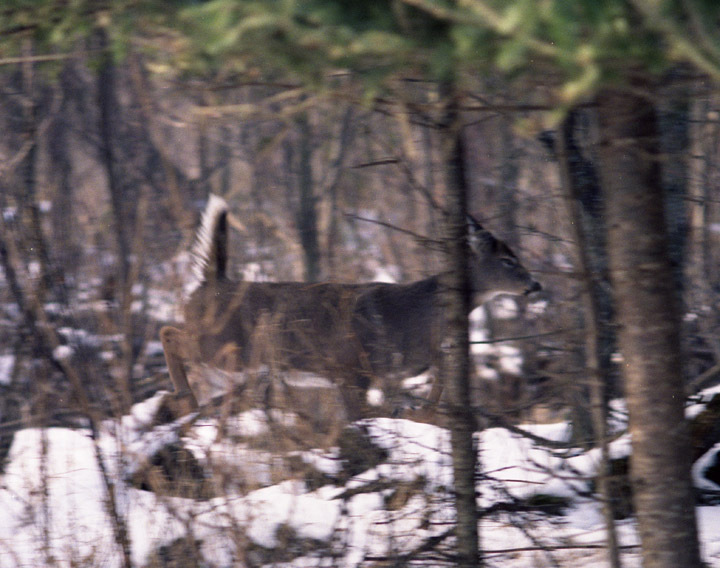 A whitetailed doe bounding away in Stage 4 alarm. Her tail is up — fully fanned. Notice the tarsal glands inside her rear knees are erect. As she bounds away, her tarsal glands are emitting an ammonia-like scent that will mark this area as dangerous for all deer for days to come. While greatly alarmed, she is not panicked or snorting as would be the case of Stage 5 alarm. A whitetail responding with stage-four alarm is stricken with great alarm and confusion. Caught by surprise, the deer suddenly realizes a potentially dangerous creature is very near but it either doesn't know where the dangerous creature is located or ir doesn't know if the creature is actually dangerous, the revealing sight, sound or scent being unfamiliar (a common failing of inexperienced fawns and yearlings). The deer may react in one or more of several ways. This is the moment before this buck bounds away. Notice its tail has gone up, but is not yet fully fanned. Notice the tufts of the tarsal glands are erect. In all likelihood, he sprayed his tarsal gland's danger scent as he bounded away. For one, white tail and rump hairs will be fully erect and fanned. Its tail may remain down, fully upright, horizontal or alternate between these three positions. Tufts of hair overlying its tarsal glands, located on the inner surfaces at the tops of the long bones of its lower hind legs, will be erect, revealing these glands are now emitting a potent, ammonia-like odor (danger scent) that warns other downwind deer of the danger. 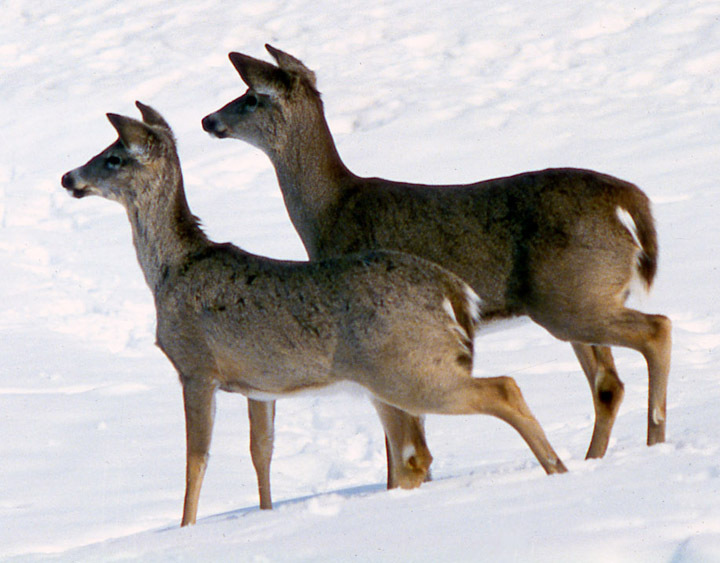 The deer may freeze, head high, ears alternating between the cocked forward and the fully-back position, ears, eyes and nose straining to detect further information, or it may mill about, movements abrupt and jerky, poised to flee. It may make false starts in random directions, pulling up short each time. It may snort repeatedly, continuing to snort repeatedly while it flees from the area. This buck has noticed the hunter in the tree stand, is alarmed, but is still unsure. He has just stomped his right-front hoof in an attempt to get the hunter to move. Inexperienced yearlings unsure of the identity of a motionless hunter may repeatedly stomp a fore-hoof on the ground while intently staring at the hunter, obviously hoping this will trigger a response that will aid in determining, the strange object's identity and/or intention. It may suddenly bound or trot from sight and soon return, obviously consumed with curiosity — a not uncommon failing of yearlings. Whereas rapid flight from the area is inevitable for most whitetails reacting with stage-four alarm, older bucks are more likely to move stealthily away, tail down. Upon suddenly finding yourself near one or more whitetails reacting with stage-four alarm (it's usually sudden), keep in mind these deer are alert as they can be and ready to disappear with remarkable abruptness. The mere blink of an eye can make them leap from sight well before you can raise your weapon and take aim. A lack of motion and sound on your part can eventually convince deer exhibiting stage-four alarm they are safe. 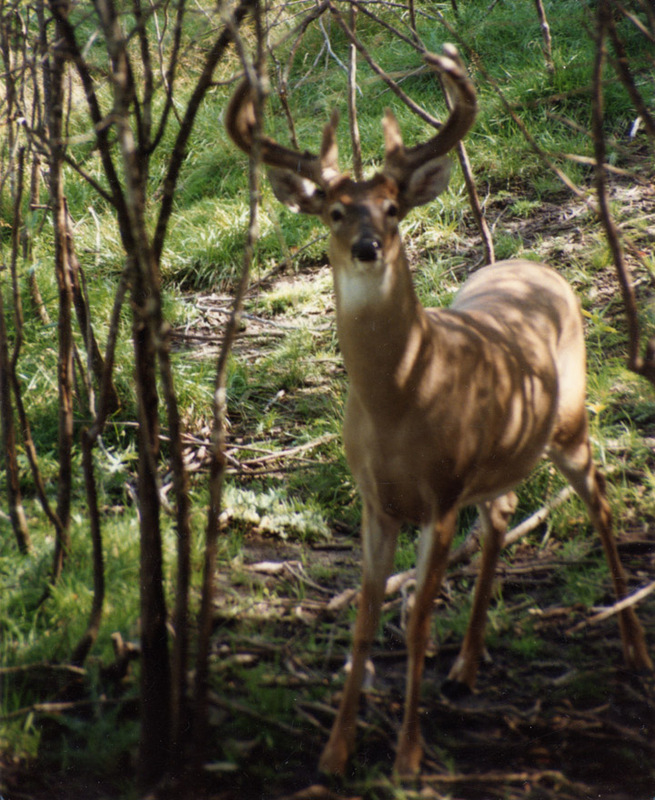 Once they have settled down, your odds of taking a deer will be much improved. Keep in mind, snorting, noisy tail-up bounding and danger scent will ruin the site for deer hunting for four or more days. Whereas antlerless deer may return to the site after four quiet days have passed, older bucks are unlikely to return to spot where stage-four alarm has occurred until after the hunting season is over. Though stage-five alarm is not the most common of alarm stages characteristic of whitetails, this last-ditch response to danger is the most commonly seen and heard by human whitetail hunters, being typically noisy. It is also the most ruinous to deer hunting, its consequences being so complete and lasting. A deer reacting with stage-five alarm — trotting rapidly or bounding with all possible speed (30-40 mph), tail up, white tail and rump hairs fully erect and fanned, tarsal glands emitting danger scent — is fleeing from recognized danger and it knows where the danger is located. Following a close range, unexpected encounter with a dangerous predator or human, snorting during flight is common, more especially by antlerless deer. 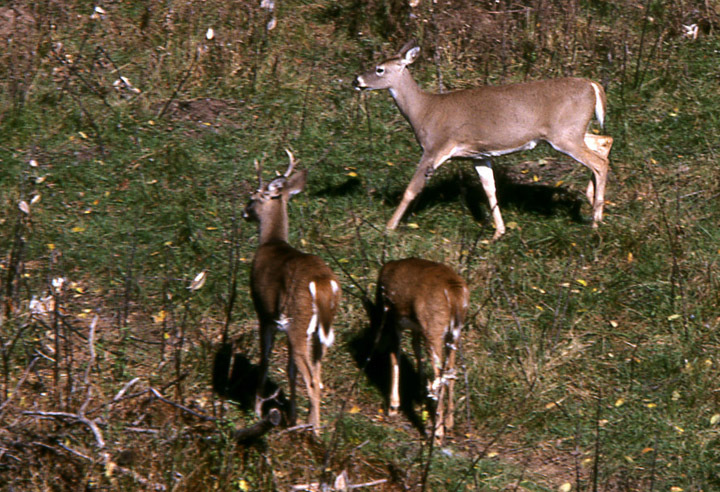 A greatly alarmed whitetail's first goal is to gain a safe distance as quickly as possible. As soon as this is accomplished, it will swing into the wind, using its nose to avoid possible ambushes. Along the way it will occasionally halt to determine (primarily via hearing) whether or not pursuit is in progress. If pursuit is indeed in progress, the deer will use its superior speed and its ability to leap through, across and over cover, terrain and objects pursuers cannot easily leap through, across and over to discourage pursuit. Its final goal is to find a safe refuge. 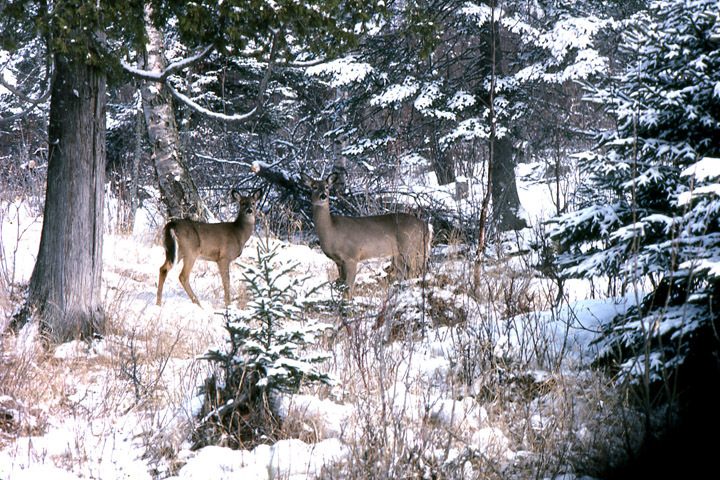 If the deer is a doe with young or a yearling, after fleeing off range, if necessary, and escaping pursuit, it will return to its home range within a few days where it can use familiar cover and terrain to avoid discovery and pursuit, limiting activities such as feeding, watering and breeding to nighttime hours if necessary to more effectively avoid discovery by human hunters. If the deer is a self-sufficient buck 2-1/2 to 3-1/2 years of age or older, following rapid, tail up flight, many find safety well off-range where hunting humans are rarely encountered, if ever (in large swamps or bogs or refuges or privates lands where hunting is prohibited). There they generally remain until the hunting season is over (until no more gunshots are heard). The epert whitetail hunter's goal. Seeing, secure, mature bucks at close-range. Whether hunting antlerless deer or bucks, hunting success is always greatest where most or all hunters are stand hunters determined to hunt in a manner that keeps whitetails from bounding noisily away with their tails up. Where this is accomplished, most deer remain in their established home or breeding ranges throughout the hunting season, doing predictable things at predictable sites during predictable hours, hunting success on the last day of the season nearly as great as on the first day. Most deer seen are not alarmed to any degree, moving slowly about with their heads not much higher the their backs and the cups of their ears pointed straight ahead or to the sides. Their tails hang loosely downward, not much white showing around the edges. While feeding, heads down, they wag their tails from side to side before raising their heads or taking a step forward. They bed in their accustomed places and while bedded they peacefully chew their cuds. Hunting for such stand hunters is vastly different from those who mostly hunt on foot, the fewer and fewer of the deer these latter hunters see during a hunting season generally bounding headlong through dense cover.